Easter dishes - dietitian suggestions | Calypso Fitness S.A. Ingredients: half a glass of wholemeal rye flour, type 2000, 2 allspice grains, clove of garlic, several peppercorns, bay leaf. 1. Put crushed garlic and spices into a small jar. 2. Put the flour and pour warm boiled water. 3. Cover the jar - preferably with gauze. 4. Sourdough will be ready after 4 days - remember to stir it every day at the same time. Ingredients: half a liter of leaven, 2.5 liters of vegetable broth, 250 sausages, 2 teaspoons of marjoram, 1 teaspoon of grated horseradish, clove of garlic. 1. Add the sliced sausage and garlic to the boiled vegetable broth. 2. Cook for half an hour. 3. Remove the sausage from the soup and set aside. 4. Add sourdough - at the beginning 1 glass, then pour a little bit, checking if it is not too sour. 5. Season with spices to taste, add sausage, egg. The main ingredient of holiday dishes is egg, which can be served in a variety of ways. The base of many recipes is mayonnaise. It is worth doing it yourself, in a healthier, less caloric version. 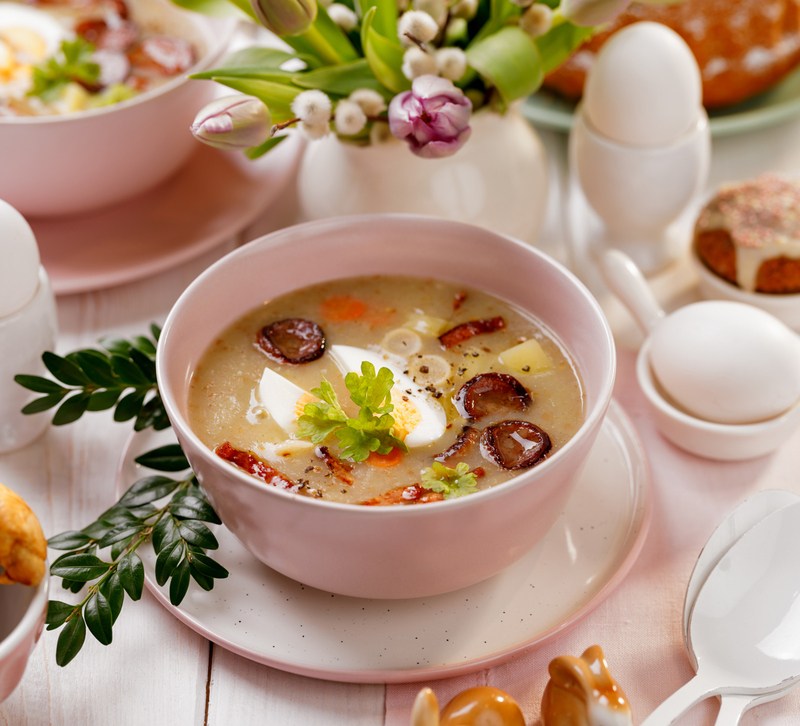 Ingredients: cottage cheese 200g, 1 hard-boiled egg, 2 teaspoons of mustard, 2 teaspoons of vinegar, salt and pepper. Preparation: All ingredients should be blended to a smooth mass. 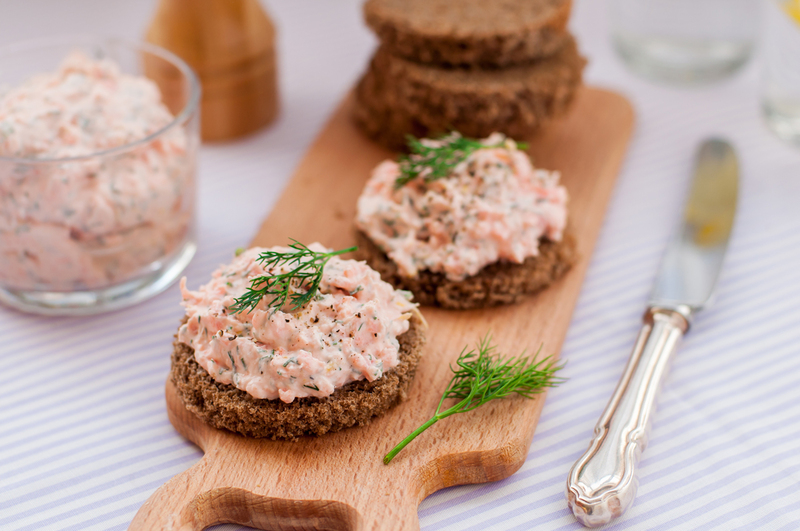 Ingredients: 5 eggs, 100 g smoked salmon, 100 g of homemade mayonnaise, 2 tablespoons of natural yogurt, 1 tablespoon of chopped dill, 1 tablespoon of parsley, salt, pepper for flavor. 1. Boil hard-boiled eggs. Then peel and cut them in half. 2. Remove the egg yolk and crush it with a fork. 3. Then mix with finely chopped salmon, mayonnaise and natural yoghurt. 5. The resulting stuffing put on the egg whites. 6. The whole can be decorated with parsley. Ingredients: 10 eggs, 10 dried tomatoes in oil, 100g feta cheese, sprouts for decoration. 1. Boil the hard-boiled eggs. Cool them, peel and cut in half. 2. Put the egg whites on the plate and put the yolks into the bowl. 3. Add the crumbled feta cheese to the yolks. 4. Cut tomatoes into smaller pieces and put in a bowl. Blend to a smooth mass. 5. Stuff each half of the egg with one teaspoon of tomato paste. Sprinkle with sprouts. It is worth giving sauces to eggs, which will emphasize their taste. Garlic sauce can be prepared from natural yogurt mixed with salt, pepper and clove of garlic. A great choice will also be red-beet-and-horseradish sauce, a finely grated beets combined with horseradish. An additional offer is natural yogurt with a small addition of mayonnaise and a large amount of chopped cress. It is worth to let the salads appear on the Easter table, which will add lightness and freshness to the feast. Ingredients: 4 eggs, 2 ripe avocados, 4 ground cucumbers, small lettuce leaves, e.g. lamb's lettuce, basil, black olives, lemon juice, salt, black pepper. Sauce: 3 teaspoons of mayonnaise (homemade), 3 teaspoons of oil, 2 teaspoons of mustard, 2 teaspoons of honey. 1. 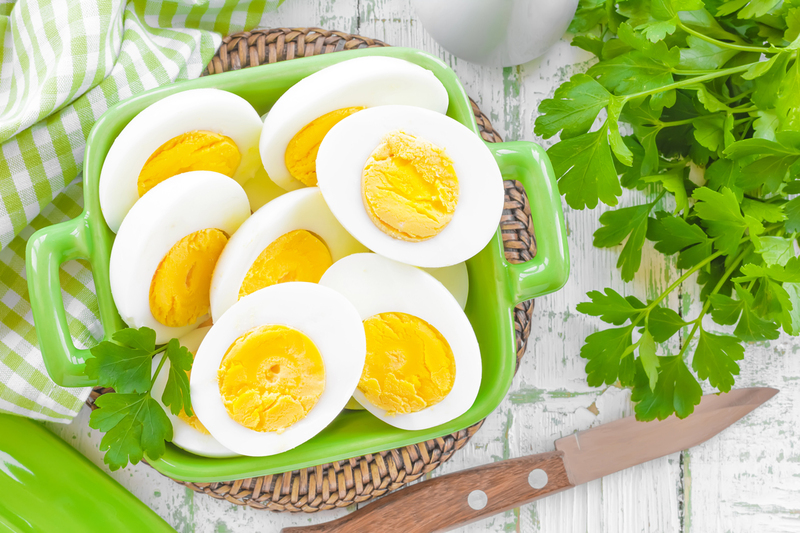 Boil the hard-boiled eggs. Cut into quarters, season with salt and pepper. 2. Prepare the sauce by mixing the ingredients in a bowl. 3. Peel the avocado, slice in half, cut into pieces, sprinkle with a teaspoon of lemon juice, season with salt and pepper. 4. Wash cucumbers, peel, cut into thin slices, sprinkle with salt and a spoon of lemon juice. Mix avocado and cucumber with half the sauce. 5. Place the salad mixed with basil on the dishes. Add cucumbers and avocado, dispose the eggs, sprinkle with the rest of the sauce and slices of black olives. The Easter breakfast cannot run out of meats. Instead of buying ready-made meats, try to prepare at least one meat yourself. You can prepare a delicious roast with pork, you can also stuff it with plums. 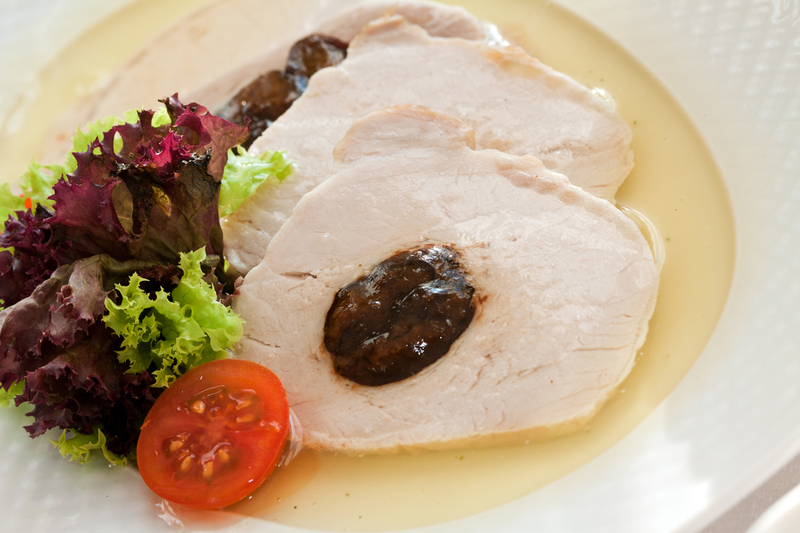 The offer for poultry lovers is breast roulades stuffed with spinach. It is also tempting to prepare pate or bread yourself. Ingredients: 4 chicken breasts, 500 g of defrosted spinach in leaves, 1 onion, ½ cup of meat broth, salt, pepper, 2 pinches of nutmeg, 3-4 tablespoons of clarified butter. 1. Heat two tablespoons of butter in a pot. 2. Peel onion and garlic, cut into cubes. Fry onion with garlic, add spinach. 3. Season (salt, pepper, nutmeg). 4. Cut chicken breasts and stuff the spinach into the hole. 5. Arrange the stuffed fillets in a casserole; add 2 tablespoons of fat, season. Cover with a lid. 6. Put in the preheated to 180°C oven for 20 minutes 7. Pour the broth on the rest of the spinach, boil and mix for the sauce. Who does not like desserts? Unfortunately, most holiday cakes are real calorie bombs. Does this mean that people on slimming diets must refuse sweets on holidays? Not necessarily! Just prepare lighter delicacies. Cake - ingredients: 330g of millet flour, 330g of maize flour, 2 eggs, 100 g clarified butter / coconut oil, 4 tablespoons of xylitol, water. Nut topping - ingredients: cup of dried dates, 2 tablespoons of peanut butter. 1. Cut butter into cubes. Separate the egg whites from the yolks. 2. Flour, egg yolks, butter and xylitol, grate with a mixer to the shortcrust pastry. 3. Add egg whites and combine with the previously formed mass. Add two tablespoons of water and start kneading the dough with your hands. 4. When the dough begins to combine well, pour onto the breadboard and knead into a smooth dough. If necessary, we can add a little more water. 5. Form a ball - flatten and cover with aluminum foil. 6. Put the resulting dough for 50-60 minutes into the fridge. 7. Remove the dough after a period of time and stain it in any form. 8. Bake at 180 degrees for about 20 minutes. 1. Dilute the dates with warm water and leave for half an hour. 2. After this time, pour water into another cup and blend it - if necessary, you can gradually add water from the soaking of dates. 3. Add peanut butter and blend again. 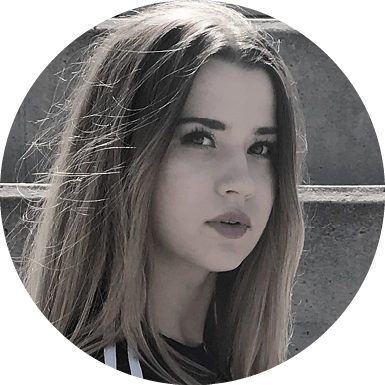 Cake - ingredients: ¾ glasses of buckwheat flour, ¾ glasses of millet flour, ¼ cup of potato flour, 1 egg, 100ml coconut oil or clarified butter, 3 tablespoons of honey, pinch of salt. Curd - ingredients: 400g of natural tofu, can of coconut milk, 4 tablespoons of xylitol, 2 tablespoons of agar, 2 drops of lemon juice. 1. Knead the flours together with butter or melted coconut oil and egg. 2. Stick the bottom to the form from the cake with the dough, the bottom of the tart prick with a fork. 3. Bake 12 minutes at 180 degrees. 1. Tofu thoroughly crumble in the food processor. Add sugar, lemon juice and stir again. 2. Boil coconut milk, add agar and cook for a few minutes. Cool it for a while and add to the cheese mass. 3. Pour the cheese mass onto the bottom of the cooled tarts. 4. Decorate with forest fruits. Maybe it's time to try to make your own bread? Here's our suggestion. Ingredients: 0.5 kg of white buckwheat, ½ tablespoon of non-ionic rock salt. 1. Rinse the groats and put them in a pot. Pour water with salt. 2. Water level 1 cm above the groats. We leave for the night. 3. After this time, mix and add some water so that the level is 0.5 cm higher than the groats. 4. We leave for the night. After this time, we strain the grits on the sieve, but not too long to be wet. 5. Put the porridge into the pot, put the blender, mix into a homogeneous mass. 6. Put the baking paper on the baking tray. Pour over the mass, put in a cold oven and leave for a few to a dozen or so hours to make the cake grow a bit. 7. After this time, turn on the oven and set to 200 degrees. Bake 45 minutes (do not open the oven at this time). We reduce the temperature to 170 degrees and bake 15 minutes more. 8. Remove the bread from the dish to a grid (maybe the one from the oven) until it is completely cooled down. Ingredients: 100 g of smoked salmon, 1 avocado, ½ of lemon, salt, pepper. 1. Peel the avocado from the skin (throw the stone away). 2. Put in a blender or a vessel in which we will blend. 3. Add the salmon, squeeze lemon juice, lightly season with salt and pepper. Mix for a smooth mass. Ingredients: 1 kg of pork shoulder, 1 carrots, 1 parsley, 1/6 of celery, 1 onion, 6 tablespoons of lard, 4 bay leaves, 4 allspice grains, salt, pepper. 2. Put the meat, carrot, parsley and celery into the pot with cold water. Add leaves and herbs and cook on low heat for an hour. 3. Take everything out of the broth and grind it when it cools down. 4. Fry the onion with garlic on the gold and add to the ground mass. Lightly season with salt and pepper. Place the baking tray with baking paper and put on the mass. 5. Bake 60 min. in 180 degrees. 6. Cool it down, put in the fridge for the night. After this time, remove, rotate the mold and remove the paper from the pate. Easter is a time when we meet with family and friends, resting from everyday stress or worries. Of course, the holiday season should not be a period of nutritional sacrifices, however, it is worth following the given instructions, if only to avoid indigestion. 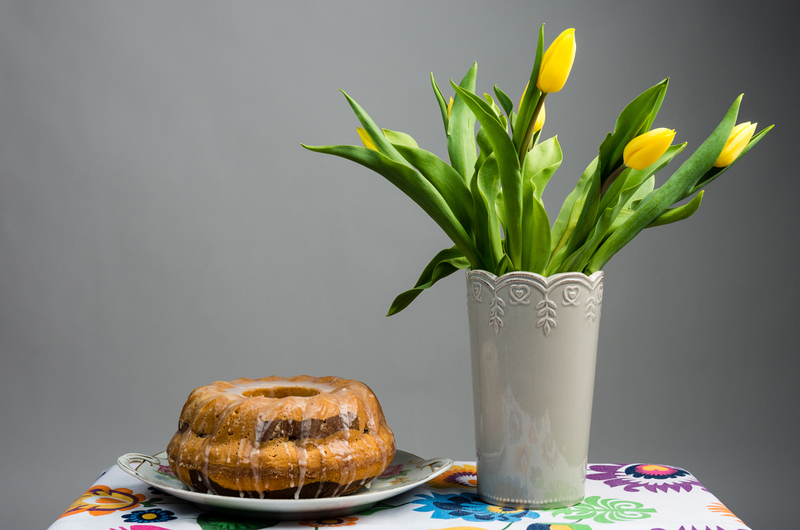 Use our Easter recipes and your table will become colorful and extremely festive.